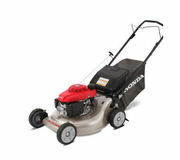 The Honda HRR 216PKU features a large 21" steel cutting deck which is light weight and easy to manoeuvre across your lawn. The massive 67-litre catcher will allow you to mow more lawn in-between emptying the bag compared to many of its competitors. The Honda HRR 216PKU is powered by a very reliable Honda Four Stroke GCV160 overhead cam engine which is easy to start, fuel efficient and extremely powerful providing you with everything you need. It is also equipped with an automatic choke ensuring your Honda starts first time every time, without having to worry about adjusting a choke lever on or off. 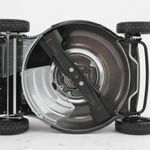 The large 8" wheels with rear ball bearings provides a smoother more consistent drive. 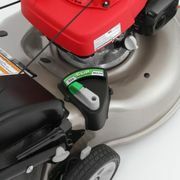 Excitingly the Clip Director has been installed on the HRR216PKU allowing you to mulch, bag or discharge your clippings with one touch. 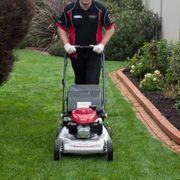 For the first time in Australia Honda has installed the exclusive twin blade system, using four cutting blades to provide a exquisite finish to your lawn. 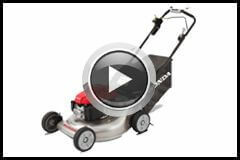 So grab a brand new HRR216PKU today! !